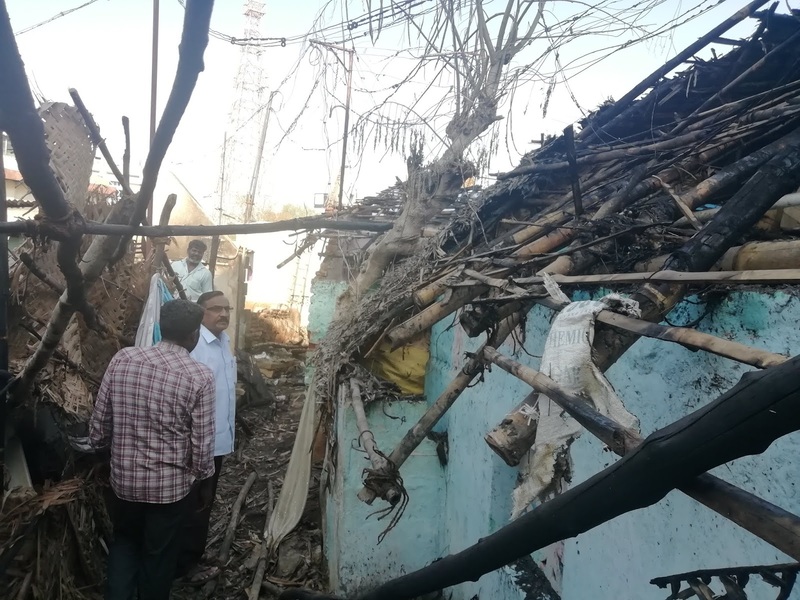 22 thatched huts gutted in a fire accident in Kuthuppapallam of Trichy. 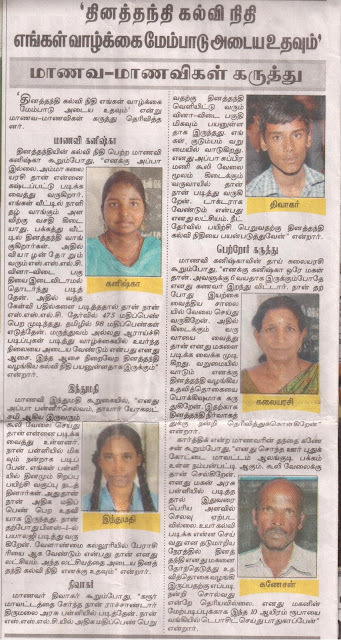 22 families for immediate and emergency expences especially for children and old age people. The fire victims express that all these 22 damaged huts dwellers need renovation of the devastated huts. 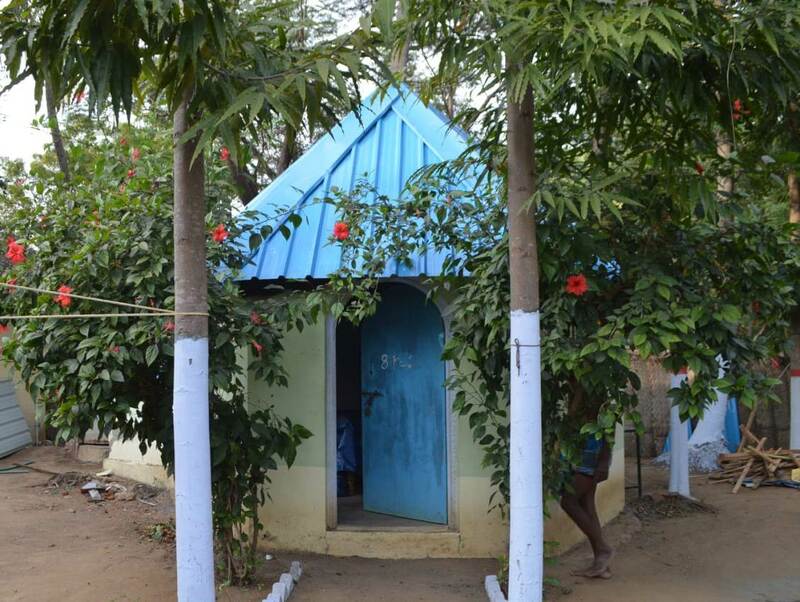 There is an urgent need to speed up the renovation as in-situ shelter with fire proof roofs. It is also important to retrieve the damaged records from Government sources and bring back the peoples life to normalcy. –Kris. International Women’s day-2019 celebrated in SEVAI Shanthi Matriculation Higher Secondary School, Pettavaithalai. 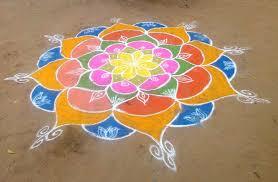 School treachers garlanded Avvaiyar drawing in School premises. 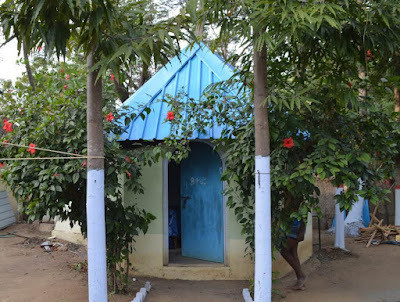 SEVAI implements watershed projects in Thogamalai Block in Tamilnadu with the approach of “Making Running Water Walk” –as the key concept of Watershed project implemented by SEVAI with the support of Society General and technical support of Casa Foundation. Director of SEVAI K.Govindaraju oriented the watershed farmers in Allur and said, “Water runs downhill.” A Watershed is a land area whose runoff drains into any stream, river, lake, and ocean. Watershed boundary is the divide separating one drainage area from another. Comprehensive Watershed Project is the process of managing human activities and natural resources on a watershed basis. This approach allows us to protect important water resources, while at the same time addressing critical issues such as the current and future impacts of rapid growth and climate change. process of creating and implementing plans, programs, and projects to sustain and enhance watershed functions that affect the plant, animal, and human communities. The main aims of Comprehensive Watershed Project are harnessing, conserving and developing degraded natural resources such as soil, vegetative cover and water; prevention of soil run-off; rain water harvesting and recharging of the ground water table; increasing the productivity of crops; introduction of multi-cropping and diverse agro-based Ecological Health: A healthy watershed conserves water, promotes stream flow, supports sustainable streams, rivers, lakes, and groundwater sources, enables healthy soil for crops and livestock, and also provides habitat for animals and plants. The watershed plays vital roles in the area's ecology, economy, transportation, industry, and general health. Surface water is just that—water that collects on the surface of the earth. This category is composed of rivers, lakes, streams, wetlands, etc. 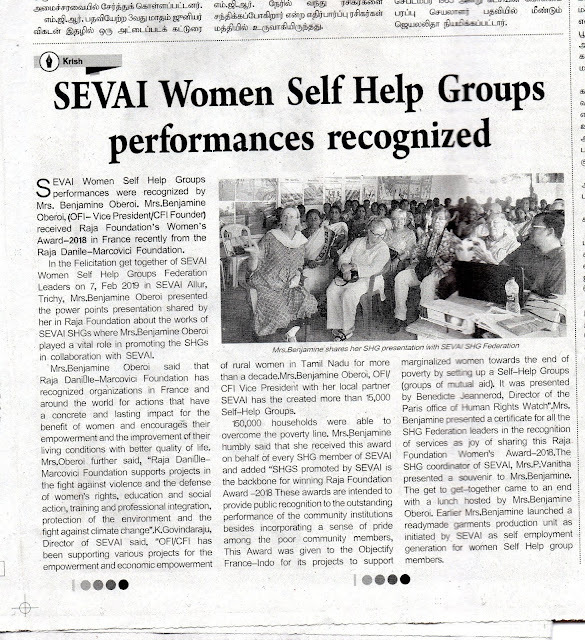 SEVAI Women Self Help Groups performances recognized. Sharing Lunch with Women SHG Leaders. “SEVAI Shanthi Matriculation Higher Secondary School infuses the qualities of Self Confidence”. - Dr.Benjamine Oberoi. 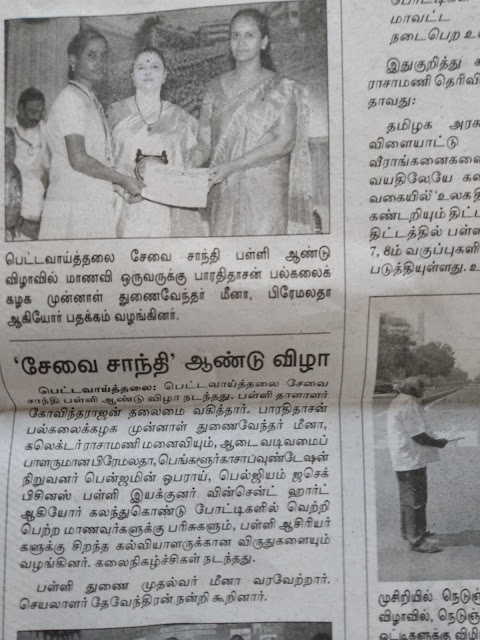 Prof.N.Swaminathan honoured with OZONE Kalam Knowledge Connectivity Award. Dr.G.A.Rajkumar I A S handover the award to Prof.N.Swaminathan. Prof.N.Swaminathan, a noted Social Development Consultant in Trichy, was honoured with OZONE Kalam Knowledge Connectivity Award instituted by South Zone Board of Continuing Education (OZONE) in Trichy on 26th January 2019.This award was handed over to Prof.N.Swaminathan by former Additional Chief Secretary of Tamilnadu Government, Dr.G.A.Rajkumar, IAS in a function jointly organized by a Trichy based NGO, SEVAI and South Zone Board of Continuing Education (OZONE). 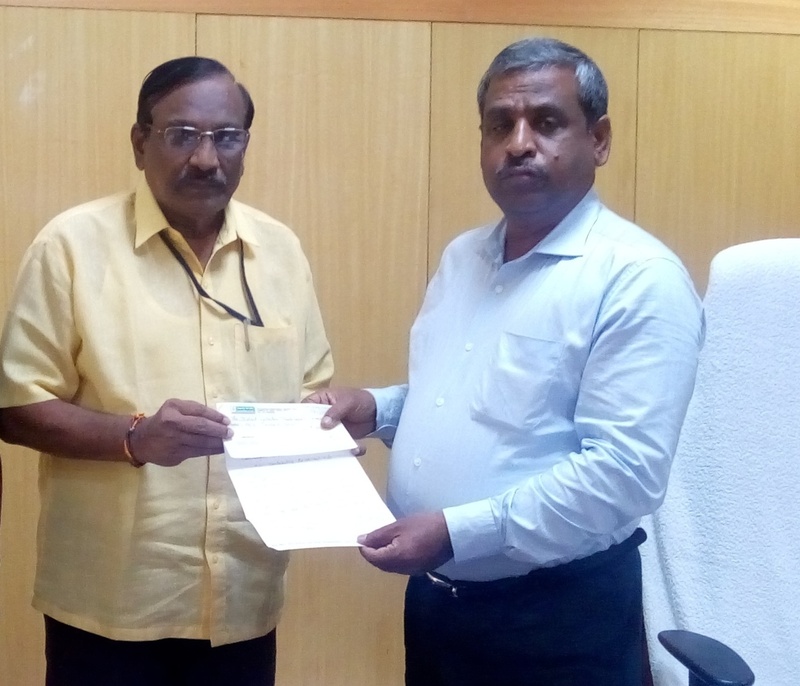 Chairman of OZONE, K.Govindaraju mentioned that Prof.N.Swaminathan is involved in community outreach services for the past 40 years and provides training to the community outreach for needy women and youth in promoting human resources at the grass root levels in the areas of community development, child care and women development, literacy projects life coping skills. 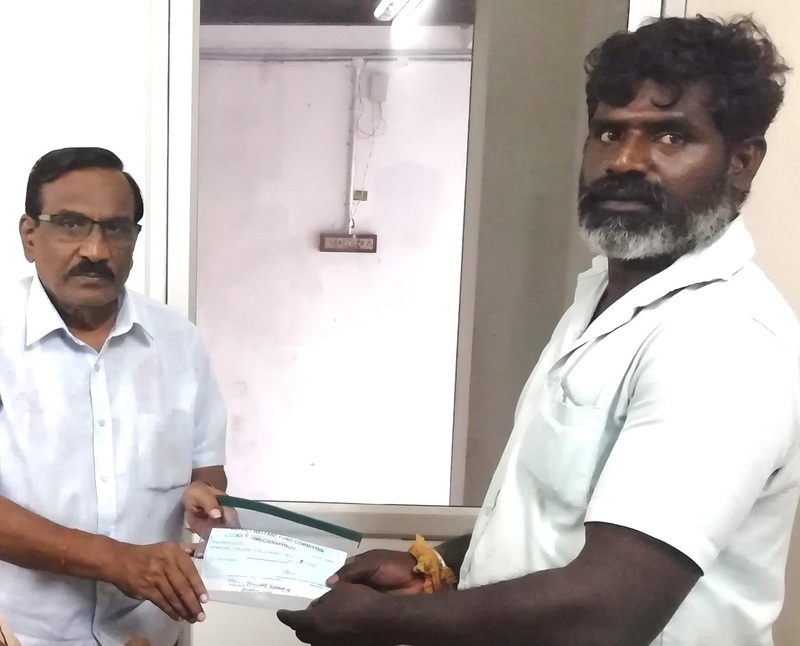 The chairman of OZONE recollected the services of Prof.Swaminathan which enabled the rural population to acquire life skills and knowledge, as well as provide a service to those who needed it most in the areas of human resources capacity building and promoted community outreach program as a big help to your local population by providing needed human resources. The Chairman of Ozone added that the South Zone Board of Continuing Education (OZONE) had taken immense pleasure in recording, appreciating and recognizing the services and lasting contributions of Prof.N.Swaninathan and OZONE was proud in conferring upon him the OZONE-KALAM Award for Community Outreach for the awardees life time achievement. Dr.G.A.Rajkmumar, the who handed over the award to Prof.N.Swaminathan congratulated him for bagging this award and said, “Community Outreach provides the community populations a sense of ownership of the community with the opportunity to become active members of their community and has a lasting, positive impact on society at large, with volunteerism initiatives which enables women and other stake holders the Psychological benefits as the training increases overall life satisfaction and helps the community to feel good about themselves because of mutual help which also help to decreases stress and ease depression. The community outreach also provides social benefits as the outreach services engages local women and youth with the community, creates special bonds with the population being served, and increases social awareness and responsibility. Community outreach helps adolescents and youth which enhance their personal knowledge, grow from new experiences, and develop better interpersonal communication skills. Community outreach service also promotes the cognitive benefits and making the target population of NGOs where the training has been provided by Prof.Swaminathan, the Cognitive benefits, as Participating in community service not only makes a difference to the organization and people being served, but also makes a difference to every youth’s career prospects. Participating in community service activities helps to enhance the young men and women resume by allowing the local community to obtain work-related skills, build community involvement with civic and social responsibility skills and become more aware of what their community needs”. 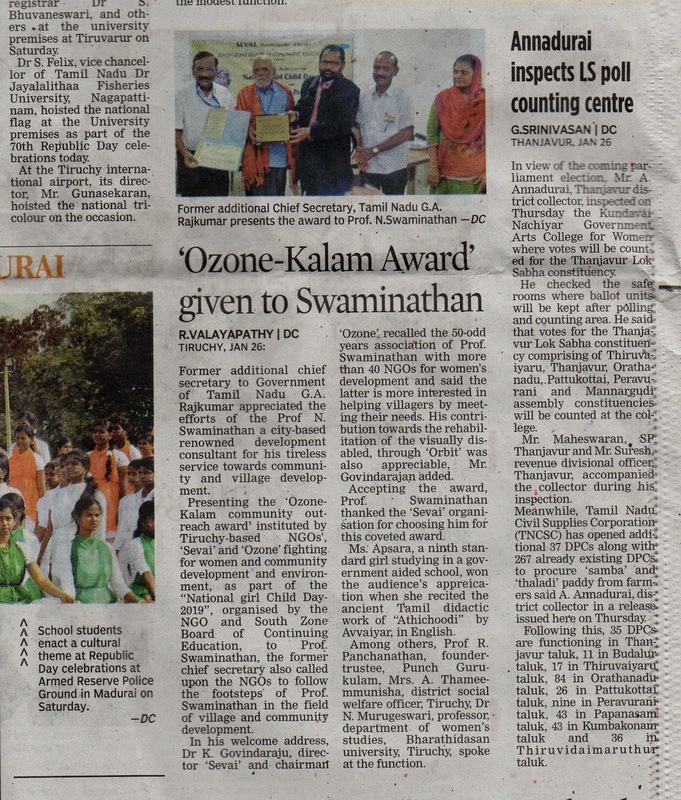 On the receipt of the OZONE-KALAM Award for Community Outreach, the awardee,Prof. 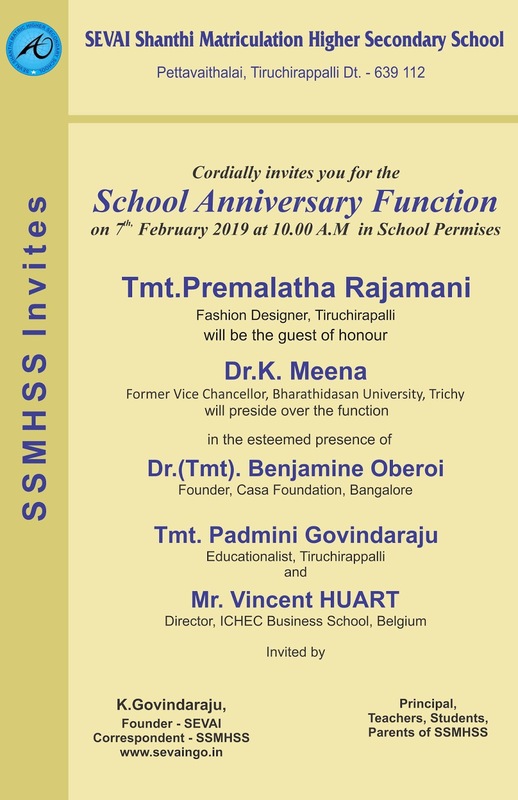 N.Swaminathan thanked one and all who supported his community outreach program over the years by NGOs, college teachers, family members and friends and also departed personalities like Prof.M.A.Windy and Sr.Rita Thaiveetil. He also expressed his thanks to OZONE for selecting him for this award named after Kalam, the OZONE-KALAM Award for Community Outreach.Prof. N.Swaminathan mentioned a few tips to the participants and emerging community outreach workers, “Meet people where they are, be respectful, Listen to your community, Build trust and relationships. Get the word out in a non-stigmatizing manner, Offer service and information in a variety of locations (including home visits) and at non-traditional times, especially after work hours”. 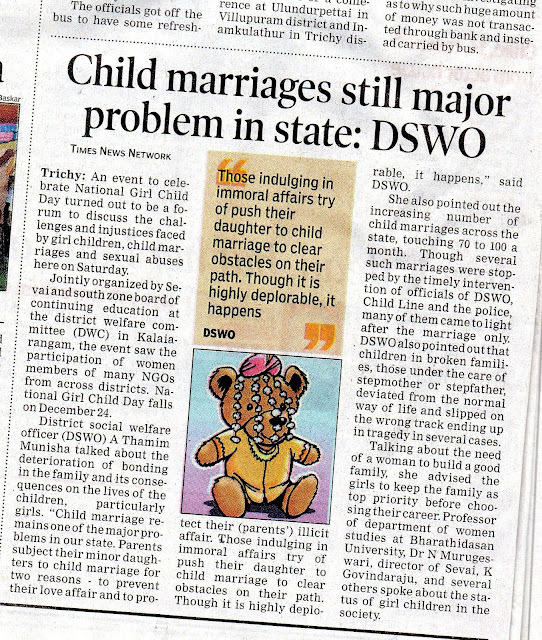 Two child marriages stopped by Childline-1098 and Government officials in Trichy District. Child line rescued a one-day-old infant girl, found inside a bag in Trichy. 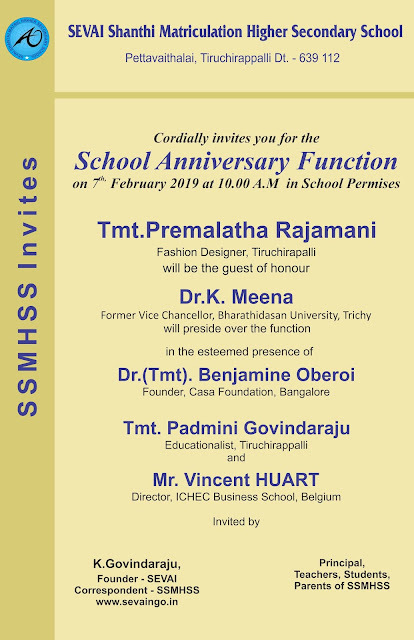 SEVAI Shanthi Higher Secondary School celebrated Pongal -2019 with customary enthusiasm with Human Trip French visitors. 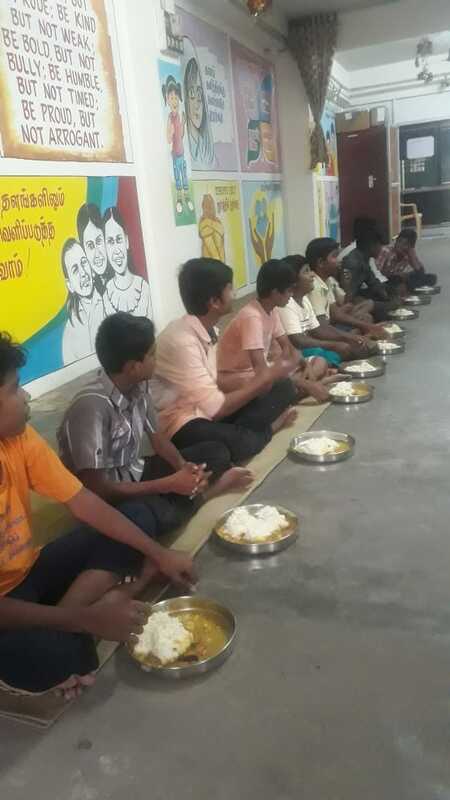 Pongal Festival celebrated in SEVAI Team in SEVAI Shanthi HSSchool. 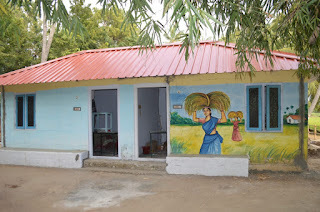 SEVAI Promotes Rural Tourism, Amoor cottages in Trichy District, Tamilnadu. 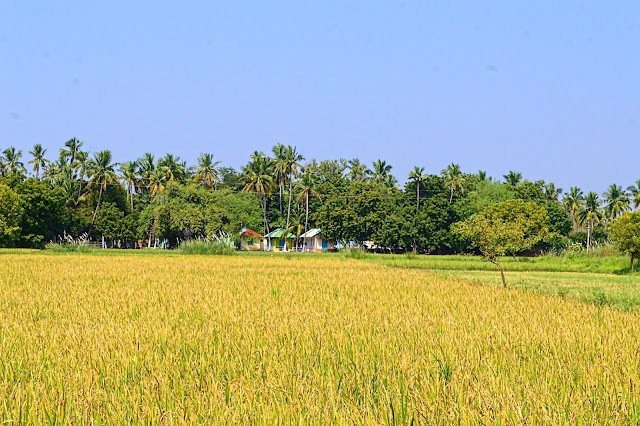 Amoor cottages view from River Cauvery. 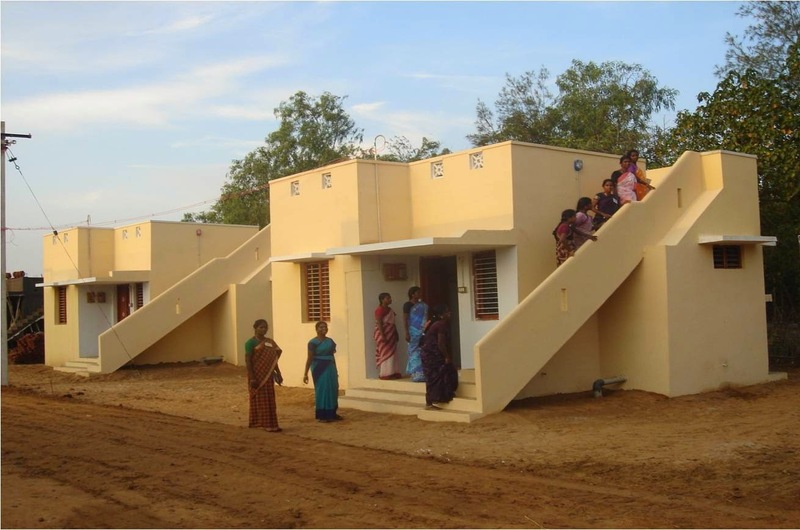 SEVAI a Trichy based NGO is involved since 1984 in constructing shelters to the disaster affected. These assistance methods vary greatly depending on the contexts, type of disaster, local capacities, scale and resources. The goal of humanitarian shelter solutions provided in the aftermath of a disaster, are to be life-saving but also to set the path for sustainable reconstruction. The emergency or relief phase should be instrumental to orient the recovery phase, and integrate risk reduction as a key aspect of reducing housing vulnerabilities. To achieve this, people’s needs and preferences are driving the process, as the main objective is to build safer and more resilient communities. Following a disaster, shelter activities immediately focuses on saving lives. This is particularly urgent where the affected people are exposed to harsh climatic conditions such as extreme cold or heat. 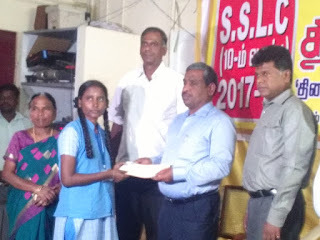 SEVAI a NGO has been chosen to run child line 1098 in Trichy District. 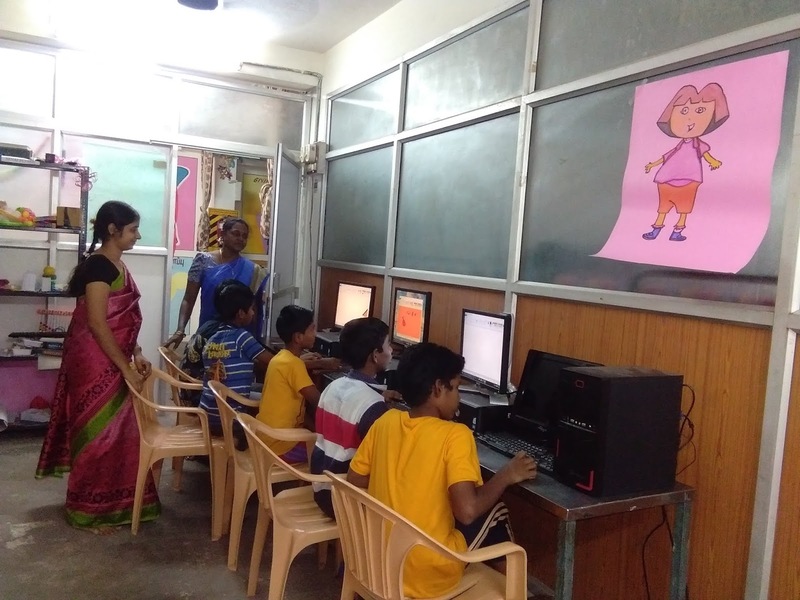 Childline Foundation of India(CIF) has chosen SEVAI a Trichy based NGO to run Childline 1098 in Trichy District as collaborative agency after eight months without a collaborative agency in Trichy, which began functioning from 1, December 2018.SEVAI closely works with Bishop Heber College, as this academic institution serves as Nodal Agency for Trichy District Childline 1098.CIF functions as Nodal Agency for Ministry of Women and Child Development ,Government of India.Child line 1098 service is a 24 hour free emergency phone outreach for children in need of care and protection. ” The Director of SEVAI K Govindaraju said, “Our missions as collab agency is to ensure children in need of help get the service at the right time,” as Childline collaborative agencies are entrusted with the task of receiving calls on its helpline 1098 and rescuing children from marriages, labour, begging, physical abuse and sexual abuse and complying with the procedure as per the JJ Act. 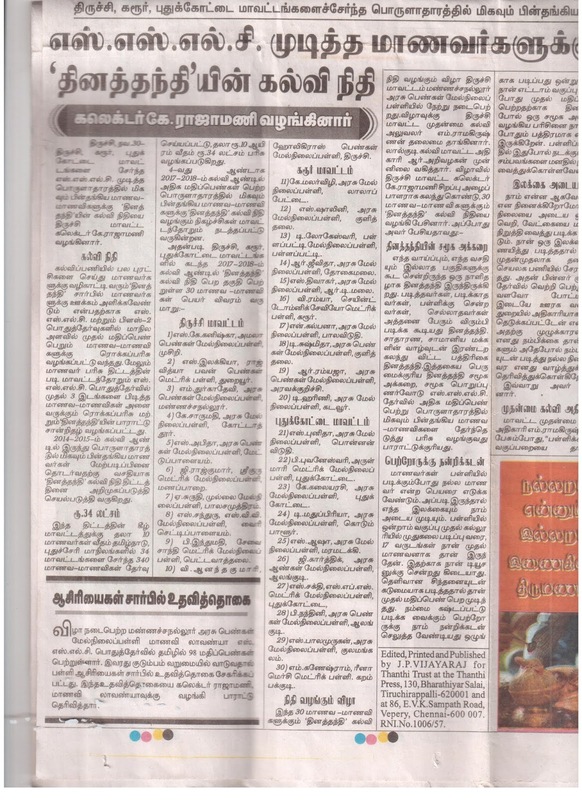 The Child helpline 1098 functions in the DWC-Commercial complex near the central bus stand in Trichy. The agency has been equipped with nine staff members including a six member team, counsellors and volunteers.Child line 1098 has a special focus is on all children in need of care and protection, especially the more vulnerable sections. Children who need emotional support and guidance, Victims of child trafficking, Children abandoned by parents or guardians, Missing children, Run away children, Children who are victims of substance abuse, Children in conflict with the law, Children in institutions,HIV/ AIDS infected children, Children affected by conflict and disaster, Children whose families are in crises. The activities of CHILDLINE include The CHILDLINE team receives & responds to the calls Crisis Intervention Direct assistance: medical, shelter, protection from abuse, repatriation, death, missing children, intensive counseling, on phone: Emotional support and guidance, information and referral to services for the caller, information about CHILDLINE, silent calls, Long-term rehabilitation, After the emergency needs of the child have been addressed, CHILDLINE explores options with the child to study, learn a trade, go back home etc. Based on the decision of the child, CHILDLINE links the child to an appropriate organization in the city. The CHILDLINE is in response to the Child Right Convention and is seen as a one point window, connecting children in need to various NGO's working for child related issues. CHILDLINE works towards ensuring that all children in need of care and protection are aware of and have access to services, that are child friendly, available when they want it and encourage them to participate in decisions that affect them. 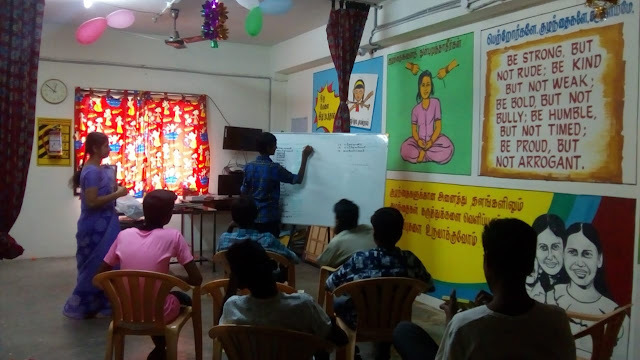 Adolescents in Thottiyapatty learn and perform Devarattam. Indumathi a student of of SEVAI Shanthi Matriculation Higher Secondary School honoured by Dinathanthi,for her academic performances, the cash award handed over by District Collector,Trichy. RCI-SEVAI Open Shelter provides a safe and loving environment for rescued children. life Enrichment classes in OS as part of NFE.